In the past, I felt I didn’t matter. I felt that I was unimportant — at best. Often, worse than that. Perhaps, you’ve felt this way too? The truth is, most of us feel this way at some point. Personally, I know many people who struggle with it. As humans, we all share in self-doubt. We all suffer from insecurity. We feel like we don’t belong, or that we’re insignificant. There are times we feel like we don’t have much purpose. We feel we aren’t important. We feel we don’t really matter. Naturally, this causes all kinds of issues. Sometimes, we experience a lack of motivation. Other times, life feels dark, grey, and depressing. Each of us matters. We matter far more than we understand. You matter. You are important. You are important simply because you are you. There is only one you. There is only one person with your past, your present, your unique traits, and your potential. You. You matter because you exist. Regardless of your religious beliefs, the fact that you exist is remarkable. It’s truly awesome when you consider every element that had to come together to bring you into existence. For that reason alone, your existence matters — not to mention the incalculable ways you are impacting the world. There is much more to you than you know. While it sounds strange, you are infinite, and you are infinitely important. Every action you take or don’t take ripples outwards touching the lives of countless beings, impacting the present and the future. You inspire people without even knowing it. Simple example: You’re here, reading this, and that inspires me. More so, you’ve inspired countless people in your life. The thing is, short of them telling you, you’d never know it. Your existence inspires a parent to go to work in the morning when they couldn’t motivate themselves. A comment you made to a classmate gave them the inspiration not to give up. You smiled and laughed at someone’s joke. That made them feel warm and cared for when they were feeling empty and dark inside. Many of the truly amazing things you do, and are capable of, you don’t even think about. They are things you aren’t even aware of. You many not think them important or impactful. That’s because they come to you naturally. That doesn’t mean they aren’t hugely important though. The point is, you’ve inspired people in profound ways. Every moment, you continue to do so. Regardless of whether you know it or not. You have enormous power. Many of the biggest changes in the world came from people who felt at some point that they did not matter. No matter how tired, weak, powerless, or worthless you may feel, you have the power to take action in some small form. Even the smallest of actions can have the biggest impacts and lead to the biggest changes. Already, you have changed people’s lives for the better. Your existence means you have opportunities right now to continue doing that. You can show people happiness. You can let others know they matter. You can offer a warm smile when someone’s life feels cold and dark. You’re ability to make a difference is endless. It often doesn’t take much, it just takes you being there. More people than you realize care about you deeply. There are many beings who care enormously about you, and about you being here. You, your existence, and your presence carries a great deal of consequence. Family, friends, coworkers, acquaintances, even the person you passed on the street… you are important to all of them in differing ways. Sometimes you can’t see it, but they care. As people, we often get so caught up in our own heads that we forget to show we care. We’re lost in our own thoughts, emotions, and struggles. We’re caught up in fighting our own battles. As a result, we take for granted the things we care about the most. We think the people we love know that we love them. We forget to show just how much they mean to us. We forget to show how important they are. So, remember, people care about you. The evidence you matter goes beyond words. Even with all this, I’m not close to demonstrating all the ways in which you matter. When it comes to life and love, words always come up short. The truth is that you must live to uncover it, to feel it, to see it. The evidence that you matter is everywhere. More presents itself every moment. It’s shown in the love people share with you. It’s even shown in the arguments and disagreements you have. Those things show that the other person thinks you matter enough to care about what you think. Only you are you. Only you can be you. You are unique. What you offer the world is unique. Even when you can’t see the way you benefit the world, you’re still benefitting it. You are capable of loving people, and the love you give people makes a bigger difference than you know. Even through the smallest gestures, you can make someone’s day, change there week, alter their perspective, and make their life happier. You have infinite potential, and you can keep reaching towards it. No matter what you have — or have not — done, there is so much that you can still do. You never know what contribution you will make to the world in the future. In fact, you’re likely not even aware of the contributions you’re making to the world right now. You have the power to change lives. Yours and others. You are an amazing person, a shining light, you are infinitely capable, and you are worthy of a happy life. You are important. You are worthwhile. You matter. You are not alone. No matter how you feel, you’re life means a lot. We all have times of feeling worthless. You are not alone. With time and effort, the feelings of being unimportant will pass. Every life matters, that includes yours. Keep going, even if you don’t feel like it right now. Remind yourself you are alive, and that alone proves you matter and are worthwhile. Be gentle with yourself. Let go of doubt and harsh self-judgment. Take steps to find a purpose that connects with you deep inside. Let others know they matter to you. Reach out to people. Get help if you need it. Who are some people in your life that matter and might not really know it? 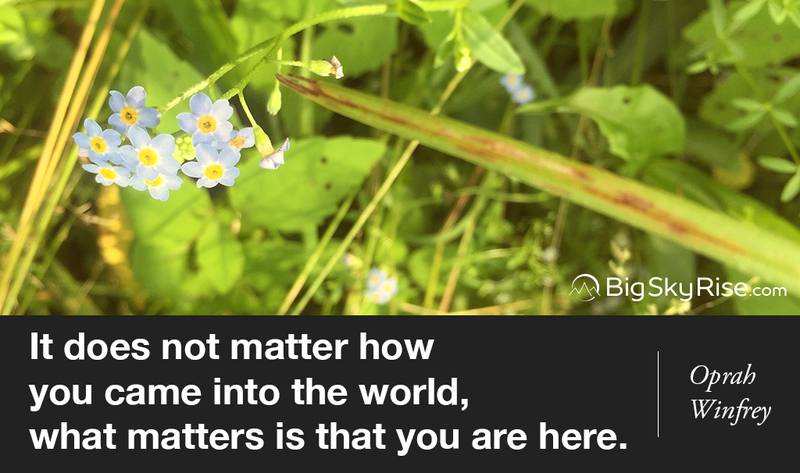 Know anyone who could use a reminder that they matter? If so, please let them know and share this post with them.